Parliament elects Michel Aoun, a former army general, ending paralyzing stalemate. Lebanon’s parliament ended more than two years of political deadlock in the country on Monday, electing as president a former army general who is the main Christian ally of the Shiite militant group Hezbollah. 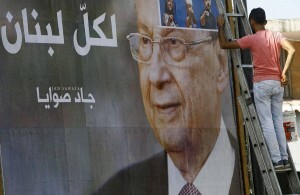 The election of Michel Aoun, 81 years old, who won 83 out of the 127 votes cast, makes him the holder of the most powerful political office for a Christian in the Middle East. Under the country’s system of government, a Maronite Christian occupies the post. In a speech to lawmakers after he was sworn in, Mr. Aoun addressed security, the economy and the repatriation of more than one million refugees from neighboring Syria as some of the main challenges facing Lebanon, a country of 4.3 million people, according to the United Nations. “There is no solution in Syria without the return of the refugees,” Mr. Aoun said. The new president also urged the strengthening of Lebanon’s armed forces to deter threats from countries on its border, including Israel. “Lebanon, which is walking among land mines, still hasn’t been touched by the flames surrounding it in the region, and we will prevent any spark from reaching it,” he said. In Washington, the State Department said Mr. Aoun’s election was “a moment of opportunity” to restore stability and government functions to the country. “The United States will continue to stand shoulder to shoulder with the Lebanese people and support Lebanon’s independence, sovereignty, security, and stability,” State Department spokesman John Kirby said. Last summer, I made it absolutely clear that peace in the Middle East was a pipedream. Indeed, with the benefit of hindsight, we can now look back at a decade in which foreign intervention did little more than foment chaos, revolution and more wars. For the evidence, just compare the two maps below. The first map shows what the region looked like about five years ago when the wars of Iraq and Afghanistan were still in full swing; the U.S. was still debating withdrawal; and nearly all American citizens voted for the presidential candidate they thought could do the best job of ending the conflicts. 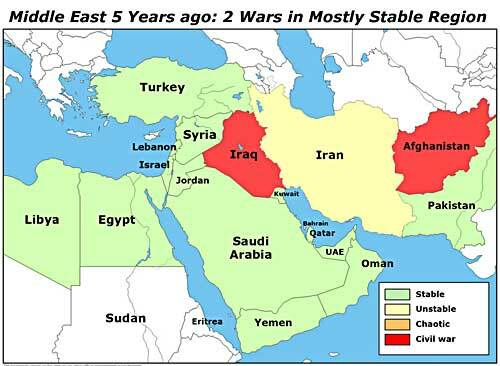 * Iran was the only other country where long-term stability could be seriously questioned (yellow). until recently, most of the conflicts were primarily domestic. The threads of cross-cutting alliances were often tangled. Direct support by regional and world powers was either limited or hidden. 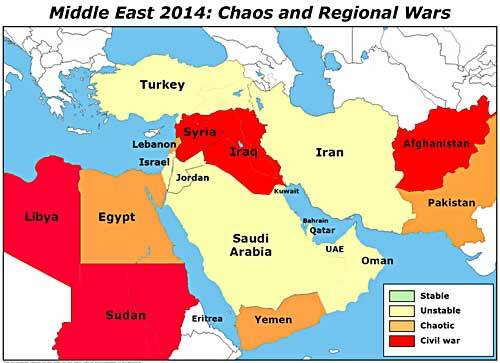 So the danger of a great Middle East war was not an immediate concern. But anyone who still thinks there’s a wall surrounding the region which can contain such a broad regional conflict needs to check into the same institution as those who think they can fix it. Iran and Saudi Arabia are more than just regional powers — they control massive resources that help power the global economy. All five permanent members of the UN Security Council — the U.S., the U.K., France, China and Russia — are heavily involved in the region. But unlike the conflicts of five years ago, the major world powers have drawn a line in the sand — U.S. and its NATO allies vs. Russia and China. Unlike any time in the past, we’ve seen U.S. and Russian battleships move into the area. And unlike any time in the past, the ECONOMIC consequences of the NEXT phase of this regional war are boundless, raising urgent questions.